Posted: Tue Feb 27, 18 9:57 am Post subject: Pollution & Lichen. There was a recent study into the most polluted roads in Derby regarding air quality. The most polluted road is the section of A38 that passes to the north of Derby and has three roundabouts on it that stop and start the traffic with traffic lights leaving standing vehicles with there resultant emissions. At the side of one section is Markeaton Park one of Derbys top parks, traditional parkland and lake with a large number of old trees. Whilst walking the dogs I have noticed a lot of green lichens growing on the trees as close as 200 mtrs from the A38 and just wondered if generally the pollution goes up into the atmosphere and does not affect the adjacent areas , or is the growth of lichen not a reliable indicator of air quality or have I missed something. It will be interesting as there a presently plans to dig tunnels under the islands so there will be no standing traffic by 2022. Different lichens react in various ways to different pollutants. It isn't just as simple as "Pollution = no lichens" I'm afraid. I will try and find better information during the day and post it unless somebody beats me to it. I guess my question would be which pollutants are you thinking of? Some of them may actually benefit the lichens to some extent. Yes. Some lichens are nitrophilic and respond well to nitrogen pollution, whilst others are nitrophobic and decline in areas of high nitrogen compounds. Nitrogen compounds would, I think, be the main pollutants close to roads. It would be good to have the lichens you see identified to find if they are, indeed, nitrophiles. Acid rain, from (mainly) sulphur dioxide was the main cause of large lichen declines, but with the reduction in the use of coal, and with other measures to reduce sulphur emissions, a lot of lichens are recovering their former distributions. That's what I understood too Henry. 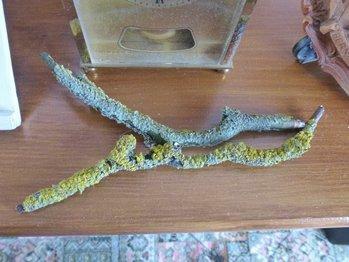 I think you are right about sulphur dioxide being the main cause of lichen death. That has decreased overall, and even vehicles produce less than they did with low sulphur fuels. I don't know about the nitrophiles and nitrophobes, but think most work on lichens has been done on the effect of sulphur dioxide. There is certainly a lot there. I can't identify it, but looks quite familiar so don't think it is one of the rarer ones.